My thread on the Roadfood forums got praised in the Roadfood weekly newsletter, so I am really trying hard to finish this report in a timely manner. Lori had been much taken by the description of the Camellia Grill, and still wanted to go. 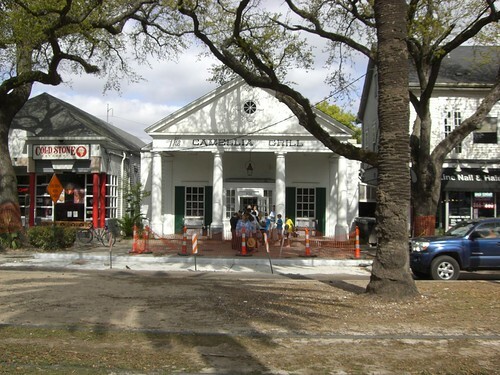 But we woke later than we'd planned on Saturday morning, so we weren't sure we could go to the Camellia Grill and be back in time for the World's Longest Oyster Po-boy. After a bit of dithering, we decided that the Camellia Grill held more attraction for Lori than the oyster po-boy, so we went out to the Camellia Grill at the risk of missing the po-boy. 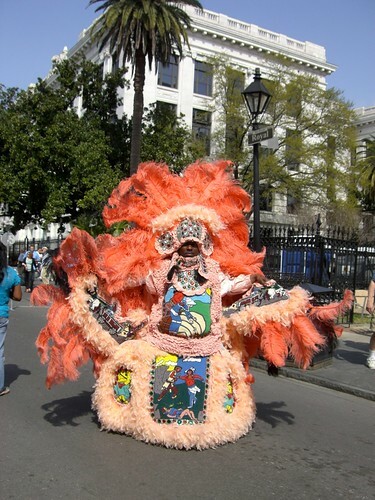 One New Orleans touch on the street car ride: we saw several trees bedecked with Mardi Gras beads. 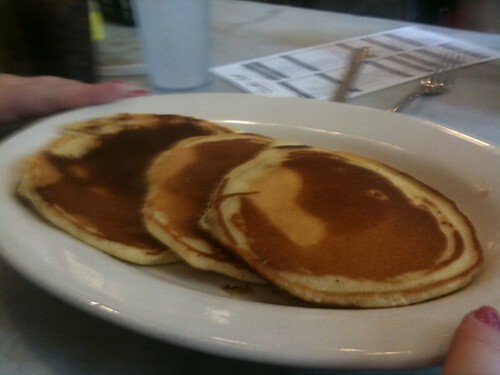 Lori is a pancake aficionado, so there was little doubt that she would order the pancakes. She declared these pancakes to be among the best pancakes she had ever tasted, and I see no reason to disagree; these were light, fluffy, buttery and opulent, made more buttery and opulent by pitchers of melted butter at each seat. 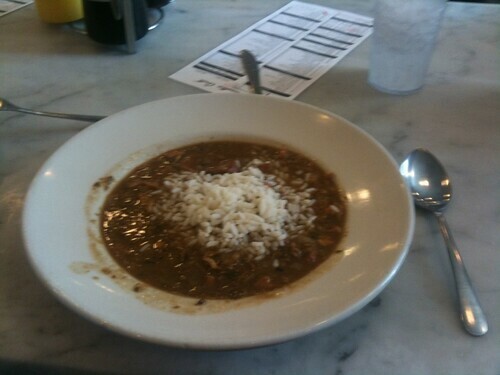 The gumbo was rich and hearty, with nuggets of gentle andouille heat. For dessert, we had the grilled pecan pie. This Camellia Grill specialty is one of those excellent recipes born out of necessity; the pecan pie is grilled because the Camellia Grill has no microwave or oven, so the only way to heat the pie up is the grill. (I suppose this is not completely true, but the grill is probably a better way to heat the pie than the gumbo pot.) The results are very nice; the pie had a crust on all sides like the top of a normal pie, and it carried tastes of the rich buttery flavors from the grill. At last, we made it back to Royal Street for the Roadfood Festival. 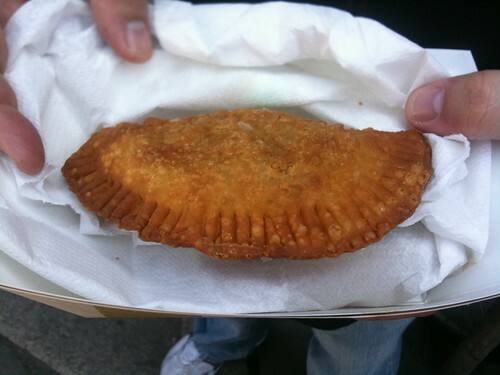 Our plan was cautious: first we would walk down and see all the vendors, then come back and eat what was most delectable. I knew that we wouldn't stick to this plan, but I had hopes that aspiring to this plan would help us avoid becoming gorged a bit longer. We hadn't managed to connect with any Roadfooders through forum plans, but by chance leslielaws and I recognized each other as Roadfooders and introduced ourselves. Leslie and her friends (whose names I forget, unfortunately) agreed to a proposition I made: to let us sample more things, we should band together to sample things together. The five of us sampled the crawfish pie from Lasyone's. 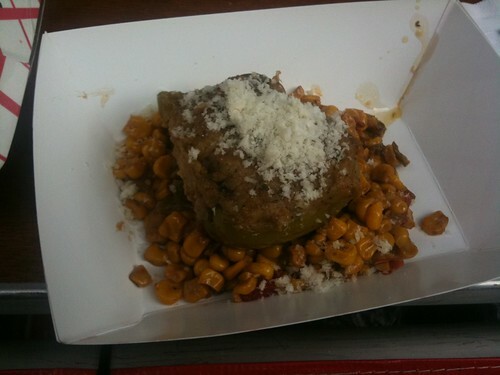 This was very tasty and savory, one of the items I would have liked to eat more of. 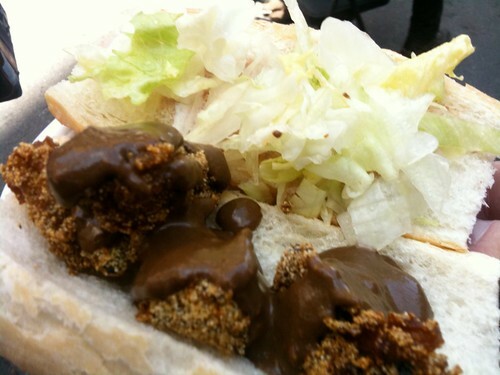 Next on the block was Antoine's Annex, serving the Oysters Foch po-boy. I learned that "Foch" is pronounced "foesh". This was not so good, unfortunately. I didn't taste the oysters strongly, but the sauce was like a greasy gravy. 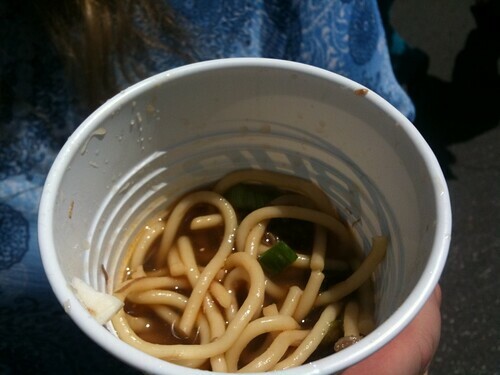 Ms. Linda's Catering served ya-ka-mein, which I had never heard of before this festival. This was a Chinese-American dish with soft noodles, beef, and hard-boiled eggs in a spicy beef broth. It was very tasty, and I would seek it out again. Lori homed in on the tent for Plum Street Sno-balls, because she had been very attracted to the recommendation from Roadfood poster X1. 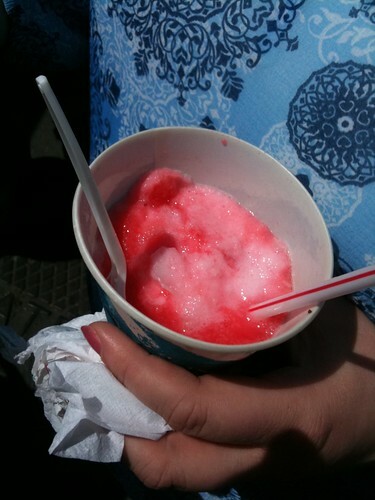 She ordered a nectar sno-ball with condensed milk, which was a lovely cool treat for the warm spring day. 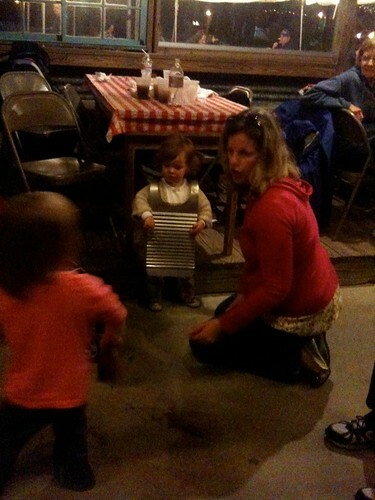 While she did that, I stood in the line for Louie Mueller's Barbecue. it was a long line, but there was a silver lining: the line was downwind of the smoker, so we got to bask in the scent of smoke as we waited. 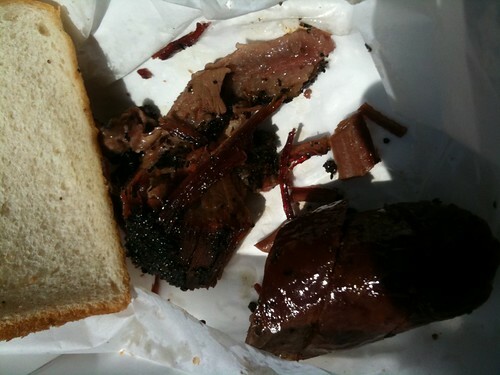 I ordered both brisket and a German hot sausage. The sausage was excellent, but a little too spicy for my taste, but the brisket was simply divine, rich and smoky and tender and juicy. 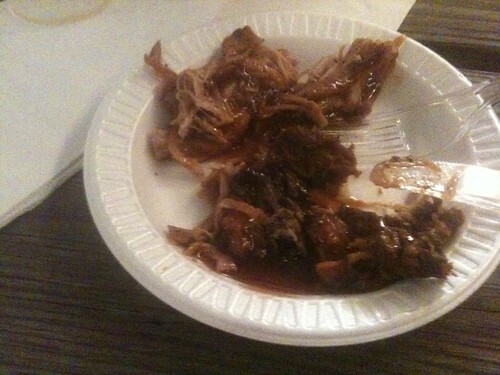 I apologize for a photo of half-eaten barbecue, but it would take a stronger man than me to refrain from eating long enough to take a picture. The last vendor in line was a pleasant surprise: Rouse's was serving mini-muffalettas that weren't mentioned on the flyer listing the foods to be had on the festival. I had wanted to try a muffaletta in New Orleans, but the muffaletta made by Central Grocery is a sandwich approximately the size of a hubcap, and we didn't have room in our dining schedule for such a large sandwich. The mini-muffaletta may not have been the authentic Central Grocery experience (I heard some comments about the bread not having the perfect texture) but it fit our plans much better. The young woman hawking the muffalettas was very enthusiastic in her presentation. When she discovered that we were muffaletta "virgins", she eagerly instructed us In the proper method of muffaletta-eating: first press down on the sandwich so that the oils from the olive salad get forced into the bread, then savor the sandwich. 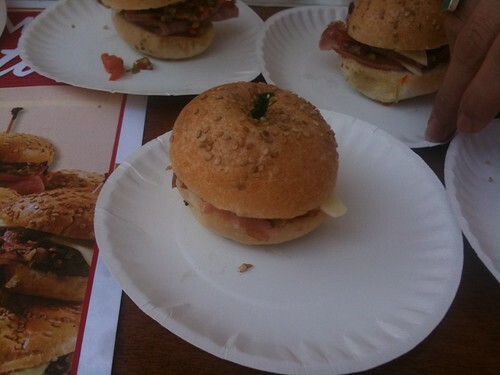 I enjoyed the muffaletta, and I know that Lori ate more than one. 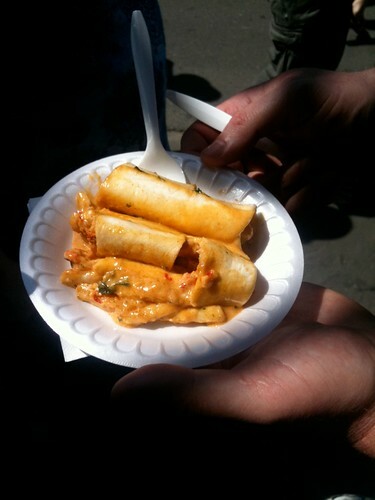 Tony Bad shared his crawfish enchiladas with cumin mornay sauce from Blue Dog Cafe, which were tasty, but were overshadowed by the many other delicacies to be had. 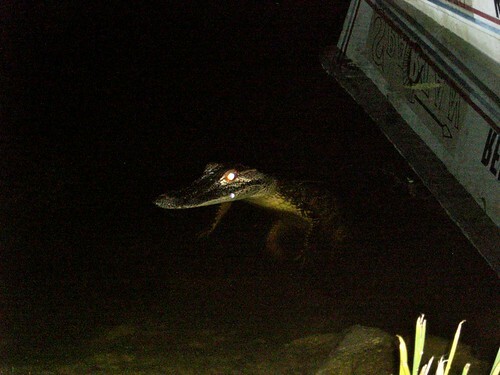 But when I declared an intention to get some of their crab and corn bisque, one of the Roadfooders said that I should say that George had said to add a scoop of grits. 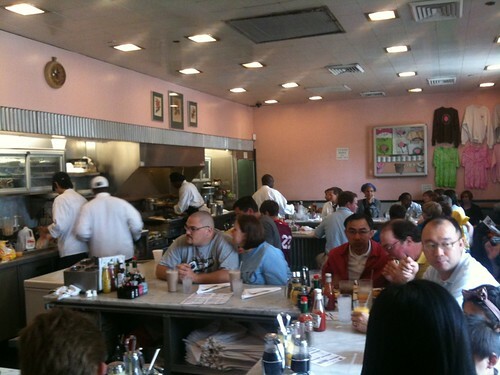 With this shibboleth, I obtained a cup of silky bisque with robust coarse grits in excellent combination. 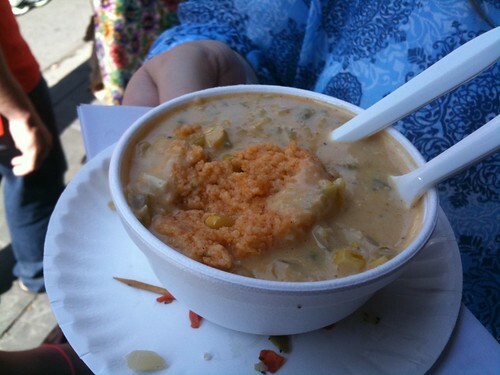 At least one of the Roadfooders (Bruce, I think) had spoken in glowing terms of the seafood chowder from Maine Diner. I wasn't wowed by the cup that I got, though; most of what I tasted was the hearty base, instead of a great variety of seafood. But it's very possible that I didn't know what to seek in the flavor. 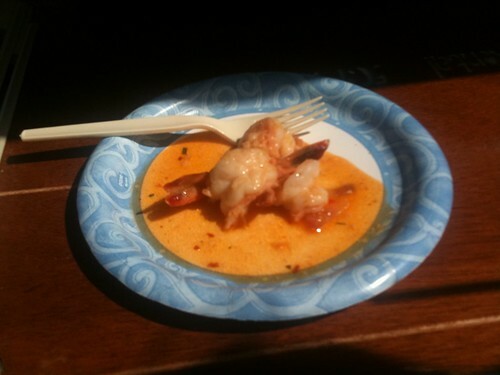 The shrimp Uggie from Uglesich's was lost on me as well; I tasted only shrimp and butter. 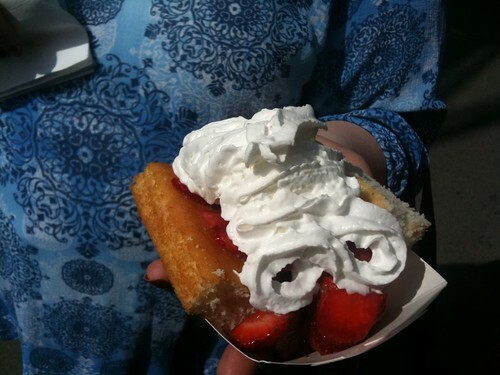 As we walked back to the hotel to freshen up before the crawfish boil, Lori stopped at Cafe Reconcile for strawberry shortcake. I found it good, but not outstanding. I should also mention the entertainers among the food booths, because they definitely contributed to the festival atmosphere. We boarded the bus for the crawfish boil at the Sheraton. 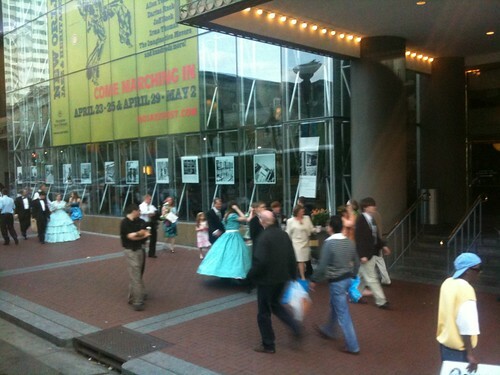 As we waited for the bus to leave, we noticed young women in large Southern-belle dresses entering the hotel. I assume that these were debutantes gathered for a ball, but for all I actually know, they could have been intrepid hula-hoop smugglers. 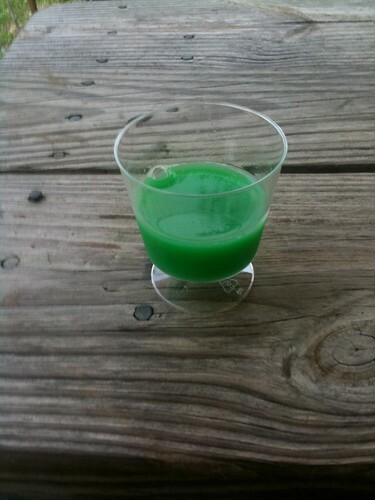 The first thing we were offered at the crawfish boil was a drink called "swamp water", with vodka, orange juice, and something green and unidentified. It tasted like a screwdriver. I got much better at crawfish extraction, but I was trying hard to conserve my appetite, and I didn't feel I could eat them all. 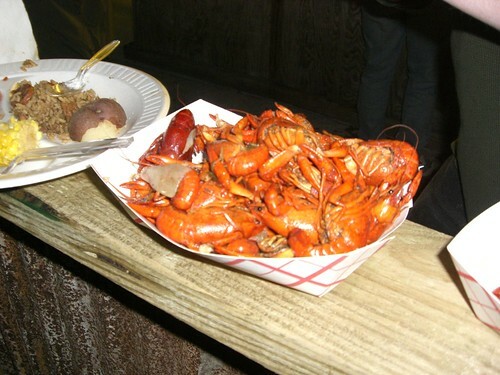 I considered returning the unshelled crawfish to the serving boat from which they came--after all, they were still in the original packaging. 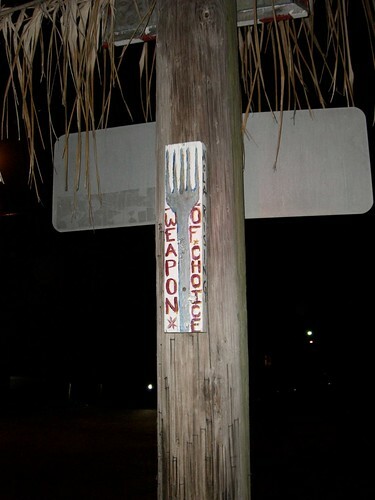 My concern for possible hygiene issues outweighed my guilt about wasting food, though, so I did not. There was also jambalaya, and though I had meant to pay attention to it as possibly the only jambalaya I would eat on the trip, I have no memory of it at all. 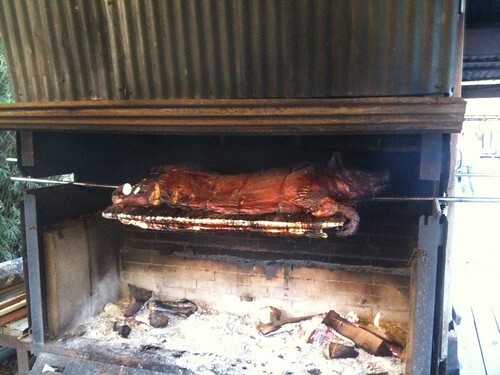 The folks carving up the roasted pig were clearly very practiced at their task, but I didn't manage to get any decent photos. This is a photo of the meat on my plate. I think the meat itself was mild, but the seasoning was very strong, with lots of salt and cayenne. I also neglected to take photos of the Q&A with Jane and Michael Stern, but that was very interesting to me. Unfortunately, I don't think it is interesting to everyone--I guess some folks were just coming to the party for the food and beer.